With 1.7 million inhabitants, the Free and Hanseatic City of Hamburg is the second largest city in Germany and one of the 16 federal states of the Federal Republic of Germany. Hamburg is both a city and a state. 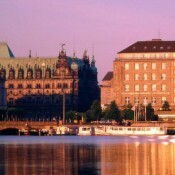 Economically and culturally, Hamburg is also the centre of all Northern Germany. 3.5 million people live in the metropolitan region of Hamburg. The port of Hamburg is the central hub for trade with Eastern and Northern Europe. As a container port, Hamburg takes second place in Europe and seventh place in the world. It is 120 km from the sea, but can nevertheless take the largest container ships in the world. Hamburg has 2,302 bridges - more than Venice and Amsterdam combined. With over 90 consulates, Hamburg is second only to New York City in the world. As a trade centre, Hamburg has always been outward-looking, and this has shaped the mentality of the inhabitants of Hamburg.